Form 6 pupils got creative making their own storybooks in their last few English lessons at Ghyll Royd. They could choose any topic, genre or idea they wanted to explore. Each child pitched a story idea to the class and received feedback including ideas on character development, plot twists, descriptions and story pacing. The pupils took their audience’s feedback on board and got to work writing their stories. 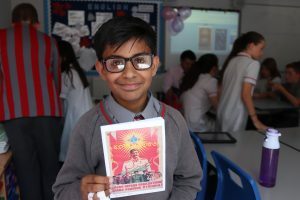 Mischa wrote a story about two wolves and Emaan wrote about two soldiers during Stalin’s ruling of the Soviet Union – lots of unique and interesting stories to read about! Finally, using the Book Creator app, the class typed up their work and illustrated it using stock imagery. Mr Coleman printed the books out for the children to keep! The stories are brilliant and look great too! Well done.